Join the discussion on our forums! Come discuss Arena Treasure Chest over in our dedicated Arena Treasure Chest discussion topic. If Team 5 hadn't set out to make the weakest expansion with Rastakhan's Rumble, then this would have definitely been a 2 mana 0/2. It annoys me to no end that 2017 had some of the strongest expansions of the game, so to fix the problem Team 5 decided to make the expansions of 2018 garbage. Maybe next year will be better. Finally, Pot of Greed disguised as a chest. But what does it doooo? I kinda wish killing the chest would give an 'Arena Master' card, just like it does give the trinket in WoW. Worst card of the set. 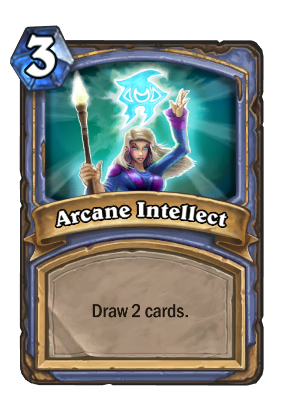 4 mana? lol. No way. Should have had "Deathrattle: Add a sealed Rastakhan's Rumble pack to your hand", but then it probably wouldn't be a common. 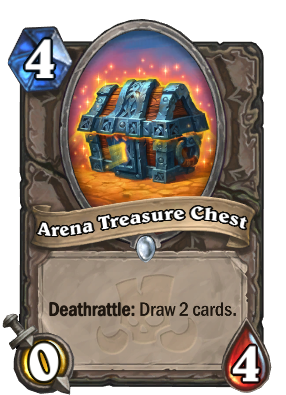 Arena Treasure Chest is obviously really bad, but assuming it's awful isn't as much fun as imagining ways you might be able to make it playable. So, how might you be able to make this work? Play it with Reckless Experimenter to turn it from a 4 mana slowly draw 2 cards to a 1 mana draw two at the end of your turn. Maybe (if you run 2x Experimenter) this can speed up a Mecha'Thun Priest deck. Use Meat Wagon to tutor it out...maybe? It looks like packs weren't enough. Now we got... lootboxes. They’re allowing Arena chests to give you a small amount of dust in a whole new way. They're always two golden commons, for that authentic 12 win Arena experience.